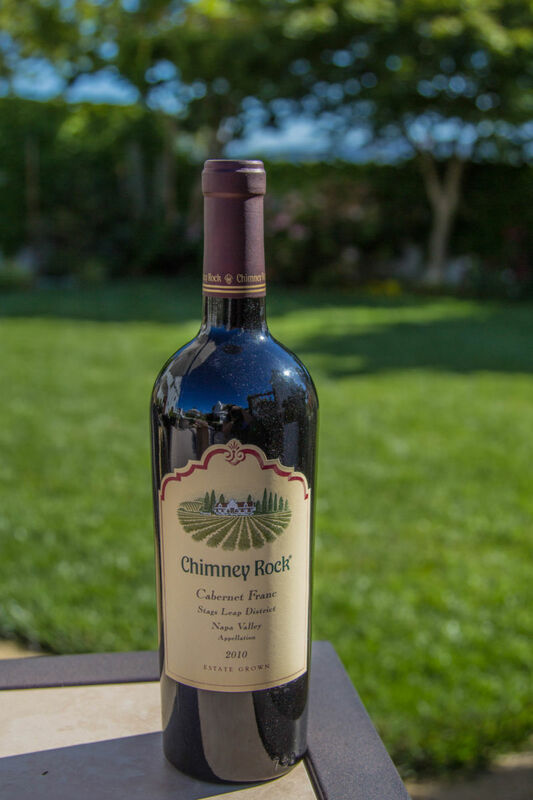 We have been to Chimney Rock Winery several times. They are owned by the Terlato family who also own Rutherford Hill Winery. 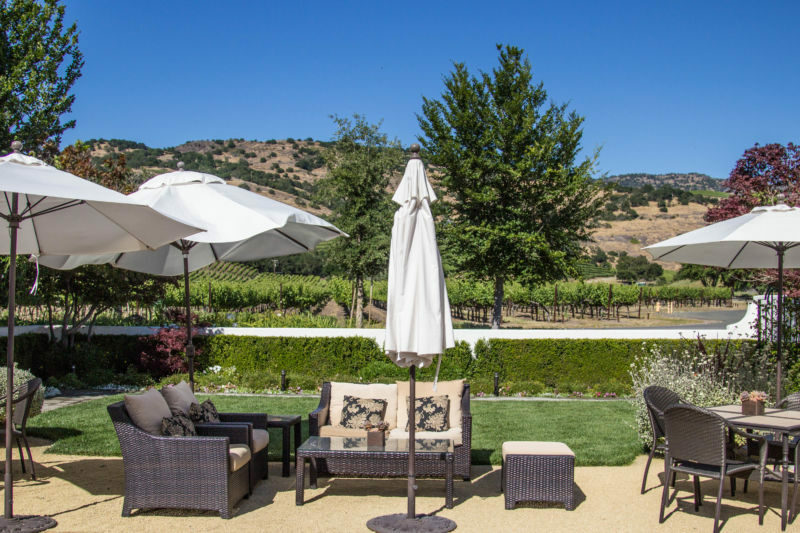 As members at Rutherford Hill, we are extended some of the members’ benefits at this sister winery. 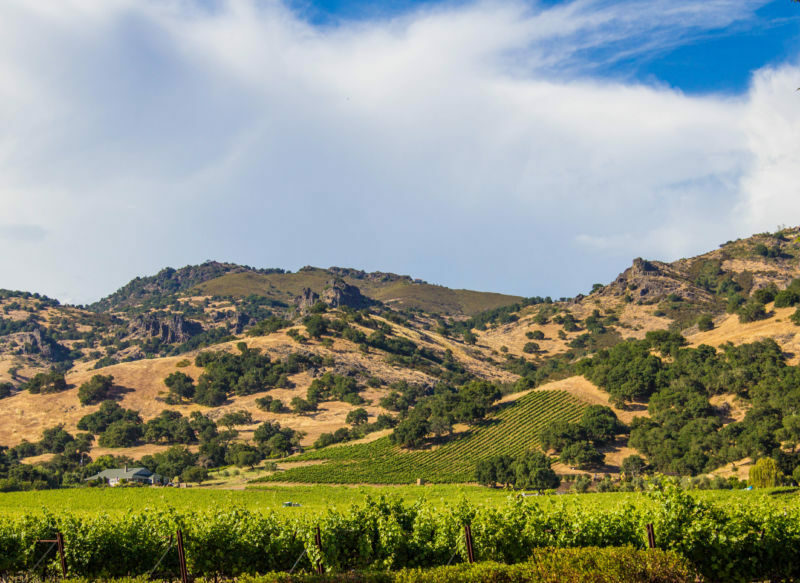 Rutherford Hill focuses on Merlots; Chimney Rock Winery focuses on Cabernet Sauvignon. They do have a couple of whites, but its their reds for which they are mainly known. The price of the tasting starts at $40. That price may seem a little steep, but they have won many prestigious awards for excellence and it is well worth the price. If you do plan on visiting this winery it is by appointment only so please keep that in mind. The Brit Comments: The tasting is expensive, but as we will describe when we write our post that focuses on the wines, you have an opportunity to compare some very fine Cabernet Sauvignon and experience the impact of vintage and vineyard. 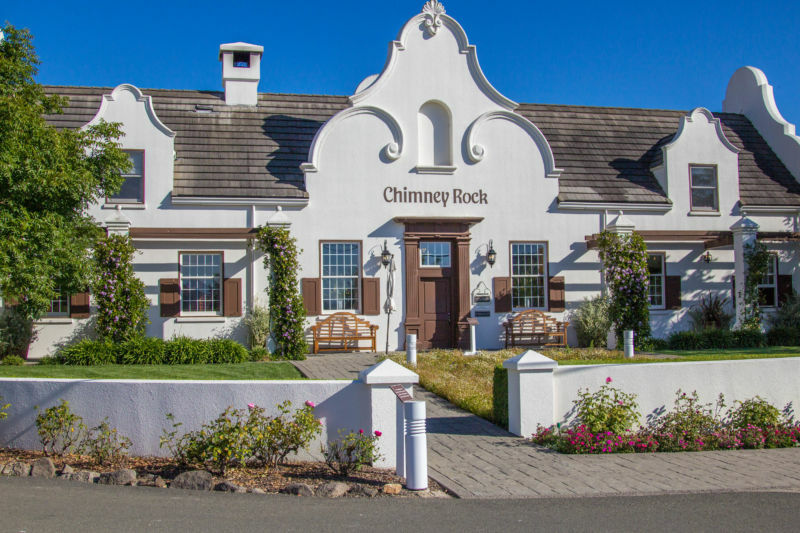 I am not going to talk about their wines during this post, but am going to focus on the winery experience and what to expect when you visit. I will be talking about the wines in another post as they deserve detail and attention. Our hostess Jen is always warm and friendly. She really tries to make the tasting experience personal. She is knowledgeable about the wine, and is a down to earth wine drinker. Her style is laid back and informative, without being at all pretentious or stuffy; I like that in a wine host. The grounds of the vineyard are very pretty. The building itself looks like a mix of architectures, but I read on their website it is actually Cape Dutch in style. 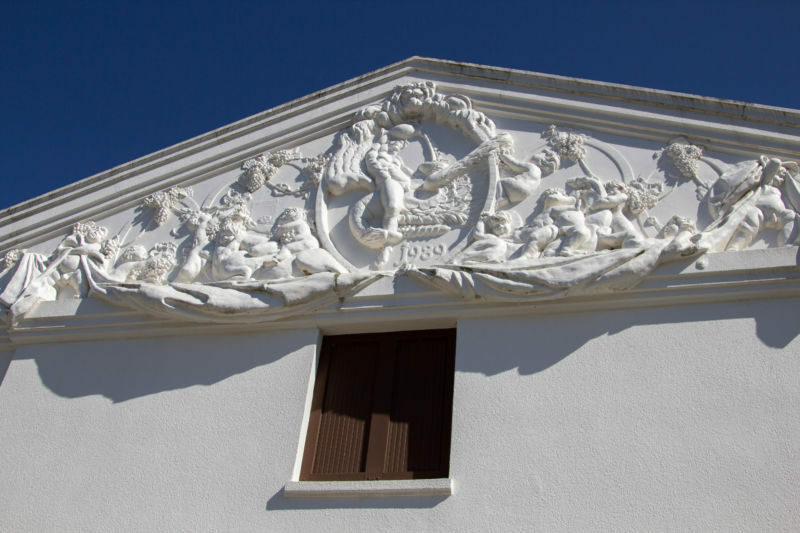 There is a wonderful frieze above the huge doors to the barrel room, which is photo worthy. The property sits off the Silverado Trail and is flanked by hills to the rear. The vines surround it on all sides. It isn’t the most showy of tasting rooms or wineries, but there is a peace and subtlety to it that I like. The Brit Comments: The tasting room’s most notable feature are the unusual pictures that adorn the walls. I admit that, unlike the wine, they are not to my taste. Between the tasting room and the barrel room lies a tasting garden. They have a fountain of water flowing softly that gives you a gentle sound. It’s quite a peaceful sun trap where you can relax, enjoy your wine, and take in the views. Not too shabby, I have to say. Unfortunately you are not allowed to bring outside food or picnic on the grounds due to regulations in Napa. I had never been into the barrel room before. Jen encouraged me to go in and have a peek. I was shocked. I have been in many barrel rooms, but this is the most elegant. Huge crystal chandeliers dominate the room, with warm rich barrels, and a beautiful table centerpiece. I would love to have an event in here. It wouldn’t hold many guests, and you get the feeling of cozy intimacy in the space. I really like that. The Palisades Society is the name of their wine club. You can choose to receive 3-12 bottles every quarter. The membership is free, but you are expected to receive one case per year at a discounted price. 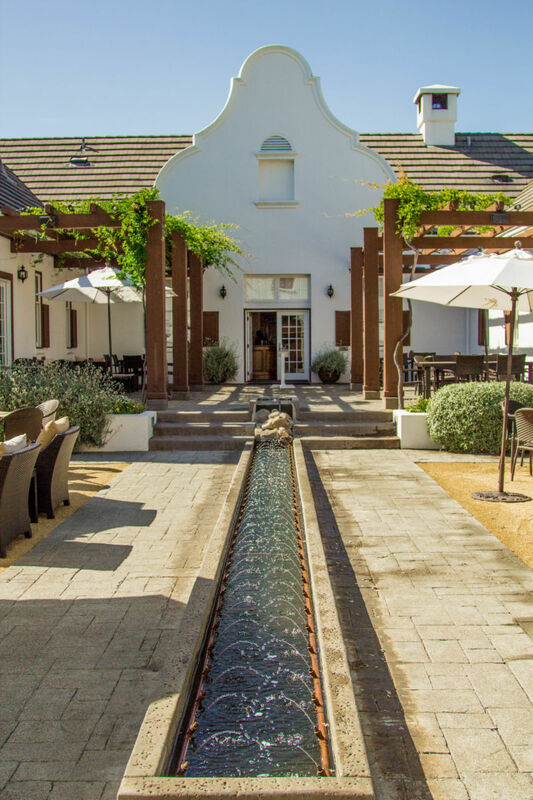 As a benefit to being a member, you can taste there any time for free, or at their sister wineries which include Rutherford Hill and Sanford Winery. 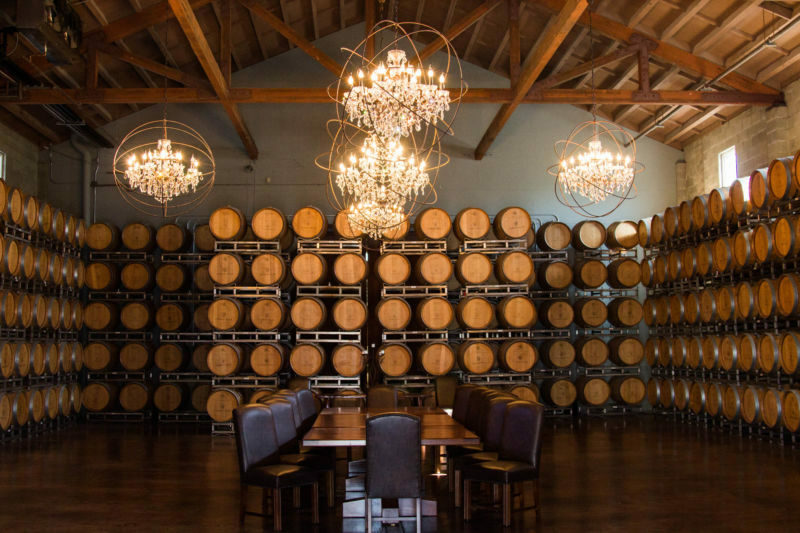 They have many members only events, along with a private tasting room. There are also event dinners that you can choose to attend for an extra fee and other little goodies that go along with being a member. Again, this is on the more expensive side, but the quality of the wine is outstanding and well worth the cost, if you can afford to do it. The least expensive membership level commits you to buying just under $1000 of wine per year. 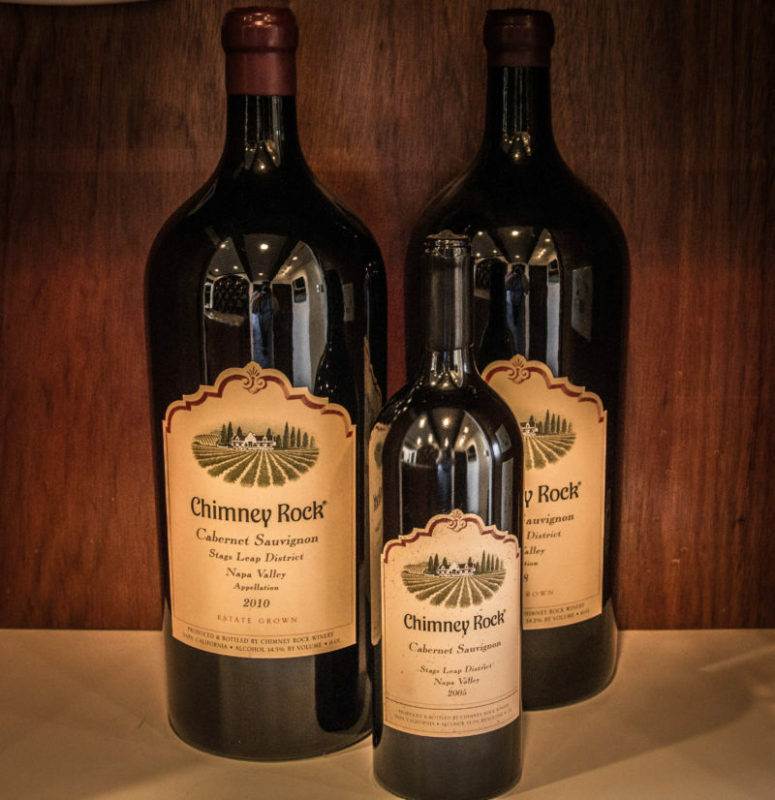 Visiting Chimney Rock is a lovely experience and I would suggest it is geared more to more experienced wine drinkers. The wines are bolder and more complex. This isn’t the place for you if you enjoy sweeter or lighter bodied wines. Even their whites are on the dry side so keep that in mind when you make your booking.